A little girl named Ciara just received a multi-million dollar settlement from a hospital that delayed her delivery and caused her to experience birth asphyxia, which caused hypoxic-ischemic encephalopathy (HIE) and severe cerebral palsy. Ciara’s mother, Paula, was diagnosed with placenta previa at 20 weeks of pregnancy. 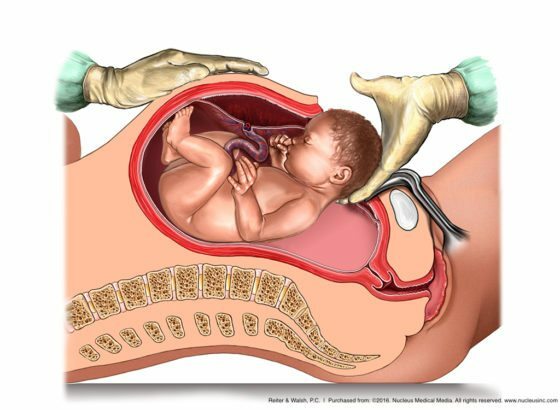 Placenta previa is a condition in which the placenta is attached to the lower part of the womb and it either partially or completely blocks the opening to the birth canal (the cervical os). When diagnosed early in pregnancy, placenta previa is usually not a problem since as the baby grows, the placenta expands and lifts up and away from the cervix. If the placenta remains close to or completely covers the cervix later in pregnancy, however, delivery by C-section is generally required as cervical opening and uterine activity during vaginal delivery can cause bleeding and hemorrhaging in the mother and even the baby. In fact, placenta previa can cause life-threatening hemorrhaging in less than fifteen minutes. As such, any bleeding from placenta previa at the entrance to the womb (vaginal bleeding) in the second half of pregnancy can be a major risk to the health of the mother and baby. Paula had frequent ultrasound scans during the second half of her pregnancy, all of which showed placenta previa. At 36 weeks and 6 days, Paula went to the hospital because she was experiencing vaginal bleeding. The hospital sent her home. Paula went to the hospital two more times after that – all within a five day period – and was again sent home. Three days after being sent home the last time, Paula went to the emergency room with more vaginal bleeding. This was 10 days after she first experienced bleeding and she was finally admitted. At admission, Paula was 39 weeks and 2 days into her gestation. The medical team attached Paula and her baby to a fetal heart monitor. The monitor showed non-reassuring heart tracings, which meant that the baby was in distress. An emergency C-section delivery was performed, but it occurred too late. Baby Ciara was diagnosed with hypoxic-ischemic encephalopathy (HIE) soon after birth, and later, she was diagnosed with severe cerebral palsy. It is the standard of care for physicians to tell mothers with placenta previa to seek immediate medical attention if contractions or vaginal bleeding occur, given the potential for severe bleeding and the need for an emergency C-section delivery. If a mother with placenta previa is asymptomatic (not bleeding) her placental position should be closely monitored with ultrasound examination and she should avoid excessive physical activity and promptly call her physician if bleeding or labor occur. An actively bleeding placenta previa is an obstetrical emergency. Mothers such as Paula who are bleeding should be hospitalized for close maternal and fetal monitoring and supportive care. An emergency C-section delivery should occur if the mother experiences hemorrhaging, the baby’s heart tracings are non-reassuring, or there is significant vaginal bleeding when the gestational age is older than 34 weeks. Paula should have been admitted to the hospital for observation when she first experienced vaginal bleeding. The frequency and severity of recurrent bleeding episodes are unpredictable, and being close to a labor and delivery unit minimizes the risk of injury to the mother and baby by enabling a prompt C-section delivery if needed as well as access to transfusion therapy in the event that the mother (and baby) lose a lot of blood. In fact, it is the standard of care to deliver the baby at 36 – 37 weeks if a mother with placenta previa has minimal or no bleeding. If there is any vaginal bleeding and a non-reassuring fetal heart rate that does not quickly respond to treatment, an emergency C-section delivery is indicated, regardless of the baby’s age. An emergency delivery is also indicated if the mother has a severe hemorrhage or is in labor. Maternal hemorrhage is a major risk of placenta previa. If a hemorrhage occurs, the baby must be immediately delivered by C-section because severe bleeding in the mother means that the baby will receive a decreased supply of oxygen-rich blood. Blood that carries oxygen from the mother to the baby is the baby’s only source of oxygen. If this supply is decreased or cut off from the baby, the baby will experience a lack of oxygen to her brain, called birth asphyxia. Birth asphyxia can cause the baby to have brain damage and hypoxic-ischemic encephalopathy (HIE). HIE is a brain injury caused by a lack of oxygen in the baby’s blood and a decreased or restricted flow of blood to the baby’s brain. Indeed, a maternal hemorrhage is very serious because the mother can lose so much blood that she goes into shock, which means her blood volume and blood pressure are so low that she has insufficient blood traveling to her organs. This can also cause the baby to go into shock. Shock is a life-threatening situation that usually requires blood transfusions, IV fluids, heart and blood pressure medications and other emergency interventions. If a baby is in shock in the womb, it is very difficult to help her; direct help can only occur once she is delivered. Baby Ciara was not delivered quickly enough and she experienced severe birth asphyxia that caused hypoxic-ischemic encephalopathy (HIE) and severe cerebral palsy. Preterm birth. Severe bleeding may prompt an emergency C-section before the baby is full term which puts the baby at risk of experiencing complications related to premature birth such as breathing problems, low birth weight, and cerebral palsy. Post-birth bleeding. After a baby is delivered by c-section, the obstetrician delivers the placenta and the mother is given Pitocin to promote uterine contraction. This helps to stop the bleeding from the area where the placenta was implanted. With placenta previa, however, the placenta is implanted in the lower part of the uterus, which doesn’t contract as well as the upper part and so the contractions aren’t as effective at stopping the bleeding. Placenta accreta. This is a severe obstetric complication involving an abnormally deep attachment of the placenta into the uterine wall that does not easily separate. This can cause massive bleeding that requires multiple transfusions and a hysterectomy to control the bleeding. Placenta accreta can lead to severe birth asphyxia. The first sign of placenta previa is usually bleeding during the second half of pregnancy. Bleeding commonly occurs around 32 weeks of gestation, but it can begin as early as late mid-trimester. The bleeding is often bright red and usually starts mildly. The bleeding may increase as the area of placental separation increases. Bleeding may stop prior to treatment, but it almost always begins again days or weeks later. Contractions may or may not be present. An ultrasound is done to confirm the diagnosis of the condition. The risk factors for placenta previa are listed below. Maternal age < 20 or > 35. The risk increases each year over 35. If you experienced placenta previa during your pregnancy and your child was physically or mentally injured as a result, we can help you. Our skilled attorneys and exceptional medical experts will work tirelessly to get you the compensation you and your family are entitled to for health care, medical expenses, special education, assistive devices, loss of income and pain and suffering. We’ve helped clients across the United States receive compensation for lifelong care. Many of our clients have come from Michigan, Ohio, Tennessee, Wisconsin, Arkansas, Mississippi, Washington D.C., Texas, Pennsylvania, and other states. Should you pursue a case with our team, you will not be charged anything until we win your case. Hello, Tina, and thank you for contacting Reiter & Walsh ABC Law Centers. We’re sorry to hear about your daughter’s developmental delays. One of our firm’s team members will be reaching out to you via email.